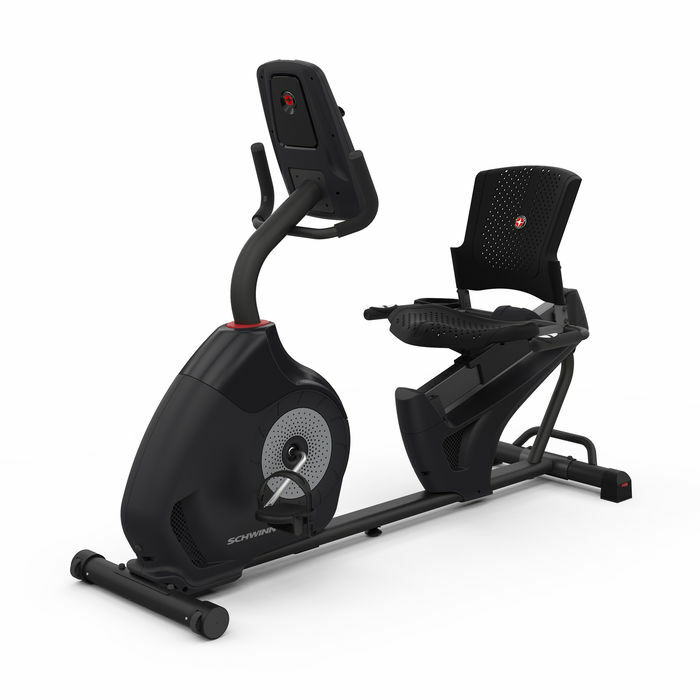 There are two ways you can look at the Schwinn 230 recumbent bike. One way is, that you might think of it as the less successful younger brother of the more sophisticated 270. The second way is, you might see it as straight up recumbent bike that gets the job done. Personally, I see it as a little bit of both. So that's why in this review we're going to dive deep into this mid-range, somewhat affordable bike, compare it to the 270 and dissect it from all ways. All just to find out whether this bulky piece of equipment got what it takes to help you achieve your goals. To recumbent, or not to recumbent? The Schwinn 230 recumbent bike is a solid recumbent that can offer that much needed low-intensity workout. However, Its 22 workout programs along with its 20 levels of resistance can help you automate, diversify, and increase the intensity of your workout over time. In addition, they also assure that you won't grow out the bike in no time. And while it doesn't have a long list of features like its big brother does, it can still help you entertain yourself while you exercise. Finally, I must say that the 230 might be the right choice for you if you're after a straight up recumbent bike that can make you work up a sweat, without all the fancy tech additions. Cycling can help you in so many ways. But what can you do if you suffer from back or joints pain? For some people, it might mean it's impossible for them to exercise on a spin or on an upright bike. And if you're one of them, then a recumbent bike might be a good option for you. Compared to an upright or a spin bike, exercising on a recumbent doesn't put that much pressure on your back and legs. That's thanks to their unique seating position, placing the pedals in front of your legs and not under. Furthermore, your back gets a much needed support from the backrest of the seat, particularly your lower back. Which is something you won't find on a spin or an upright bike. All these might make it sound that a recumbent bike can only serve elderly users. But it can also serve you if you're after a cardio equipment that offers a low intensity workout. This way you can build up a physique, improve your fitness, and progress to more advanced equipment's, like treadmills for example. On the other, you can keep exercising on the recumbent, and that will be fine too. So, now that you know all that, can the recumbent on question, meaning the Schwinn 230 be the one that will help you? The Schwinn 230 recumbent bike is the more affordable twin brother of the Schwinn 270 recumbent bike. While it doesn't pack as much features as its more expensive alternative, it doesn't fall way behind. Like its brother, the 230 is also an electric-powered, good lookin' (in my opinion) recumbent bike that can offer more than a decent workout session. You might consider buying one if you don't want to invest too much on the 270, or on a recumbent bike in general. And you won't be far off, since the Schwinn 230 may help you achieve various fitness goals. Be it weight loss, cardio boosting, health improving, etc. Let's check how it's stands in our review. The comparison table says it all. The Schwinn 270 is the more sophisticated bike out of the two. The Schwinn 230 however, will most likely fit you if you're looking for a straight up bike without all the fancy features. Furthermore, keep in mind that the 230 is priced lower than its fancy brother because it doesn't have all the features that the 270 has. Other then lack of features and a padded seat, they're both pretty much the same. At the end of the day, the answer to the question "Which one should I choose", should rely on your budget and needs. Like with any piece of home equipment, we'll start with one critical factor you should check before you dive deeper into its features. In this case, the Schwinn 230 is 64" long (162 cm) and 27.7" wide (70 cm). Which is slightly bigger than the 62.5" (158 cm) on 26.6" (67 cm) of the 270, but It's still in the normal range of footprints. But despite it slightly bigger footprint, the 230 is also not the best option for you if you're over 6'3. For safety and ease of use purposes, make sure you add extra 20" when you calculate the footprint in your place. That is, from all sides. Like its fancier brother, the flywheel of the Schwinn 230 weighs only 13 lbs. If it doesn't sound that much, it's because it doesn't. However, on high resistance level's this bike can make you work up a sweat. Especially if you're not a very active person. So, as much as I would've liked it if Schwinn had included a heavier flywheel, I won't hold it against them. That's because this bike can provide a hard workout. And because a heavier flywheel will add to the total weight of the bike that already weighs 82 lbs. But I can totally see some people considering it to be a pro, and some a con. And it uses a magnetic resistance system. Which is good for two main reasons. One, magnetic resistance system doesn't require the same level of maintenance as a padded resistance does. Secondly, you almost can't hear it. I hate sounding like a broken record, but the people over at Schwinn know how to make their bikes. Overall the Schwinn 230 is a well built and solid recumbent bike. The major parts here are your basic steel and plastic. Even so, the official max user weight is 300 lbs (136 kg), which will be enough for most people. But if you're not one of them, then there are plenty of (more expensive) models out there that can support more weight. Like the Sunny Health & Fitness - SF-RB4708 that supports up to 350 lbs, or the Exerpeutic Gold 525XLR that can support up to 400 lbs. Unfortunately, the Schwinn 230 doesn't offer Bluetooth connectivity. So it means that you can't sync and track your workout stats with the Schwinn trainer app, since this app requires Bluetooth connection. The only way you could've keep a track on your workout stats is via USB, but that's also been dropped. First of all, the Schwinn 230 has 22 preset workout programs. That's a bit low than the 29 that the 270 offers, but is still a decent number. You get 2 that you can set as you want. Another 9 are profile programs, which will automate the resistance and the overall level of the workout. This might come in handy when you just want to pedal and have the bike do all the adjustments during workout. One of my favorite programs that this recumbent bike offers is the heart rate control. And this bike has 8 of them. 4 For beginners and 4 for active users. Basically what it does is, it lets you set a heart rate that you want to achieve in your workout. The Schwinn 230 then monitors your hearts bpm VIA the heart rate sensors, and adjusts the workout in a way that will help you maintain the heart rate through out the workout. This is great when you want to get your heart to its fat burning zone and keep it there. Furthermore, there's another set of 2 programs that will test your fitness level. And they will test it by comparing your power output to your heart rate. The idea behind it is, as your fitness improves, you will put in more power at a given heart rate. And last but not least, is the quick start program, which the name pretty much suggests what it does. The console of the Schwinn 230 is the brain of the entire bike. From the console you're able to operate the bikes core features. And though it might look scary at first, especially if you're not tech oriented, learning how to use it is quite easy. For example, you can use the up/down buttons to adjust the resistance, but Schwinn also included quick level set buttons. These will allow to jump quickly from one resistance to another with a push of a button. If you ever worked-out on a recumbent bike then you know how boring it can get. That's why you're might want to place it in front of your TV. But what can you do if you don't want to place your bike in the living room? Furthermore, does that mean you will have to move it every time you want to workout? Well, that's an option, not a pretty good one, but still. On the other hand, you can utilize the media rack/shelf that Schwinn models offer. You can put your phone, tablet, or magazine on it to keep yourself entertained while you exercise. Right above the media rack you'll find the USB port that will allow you charge your device while you use it. The problem with that though is, that while you're watching your favorite show on Netflix, your tablet/phone is blocking the main display. That's why one of my favorite things about pretty much all the bikes from Schwinn is that they have dual track display. Having that second lower display is a great way to help you keep track on important workout stats. Finally, having dual track display is a handy addition, since you want to track your workout stats, while watching what ever you want on your smart device. My only beef with the display is that, in contrast to the display of the 270, it doesn't have any back light. Making it almost impossible to read in dark rooms. The seat of the Schwinn 230 is not padded as the seat on the 270. Even so, it's still quite comfortable. The seat glides on a slightly angled aluminum rail, and adjusting it is pretty straight forward. However, you won't find any numbers marks for the different seating positions. You can manually mark your favorite seating position though, in case someone else also use the bike and has a different seating position. The seat has vented holes that might come in handy when your start working up a sweat. And much like the seat of the 270, this seat is designed to support you back and push against it while you pedal. However, if you're planing on working out over 40 minutes, I'm afraid you will feel "it" after your workout. If you find the seat to be too stiff for you, you can always add a layer of soft cushion. Finally, you can only adjust the seat forward and backward. Which is pretty much enough, since recumbent bikes seats usually don't need height adjustments. The USB port used to have two purposes. One is to charge your device as I already said. 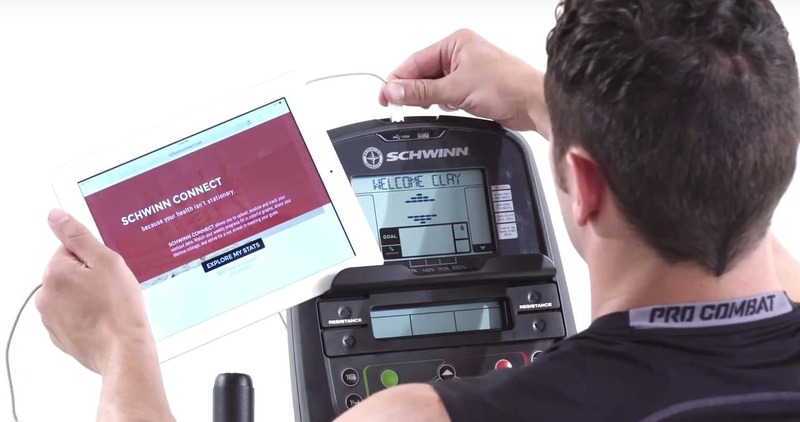 The other was the option to download your workout stats and manually uploading it to the Schwinn Connect website. Unfortunately, Schwinn had discontinued that website which means you will no longer be able to keep track of your workout stats. Personally, I really don't get why they will do such thing. I can only guess it's because they've launched their new Schwinn app that only works with models that have Bluetooth connection. Which I remind you, this model does not have. You can however manually track your stats with other fitness apps like, MyFitnessPal. That is, if you just love to work hard. 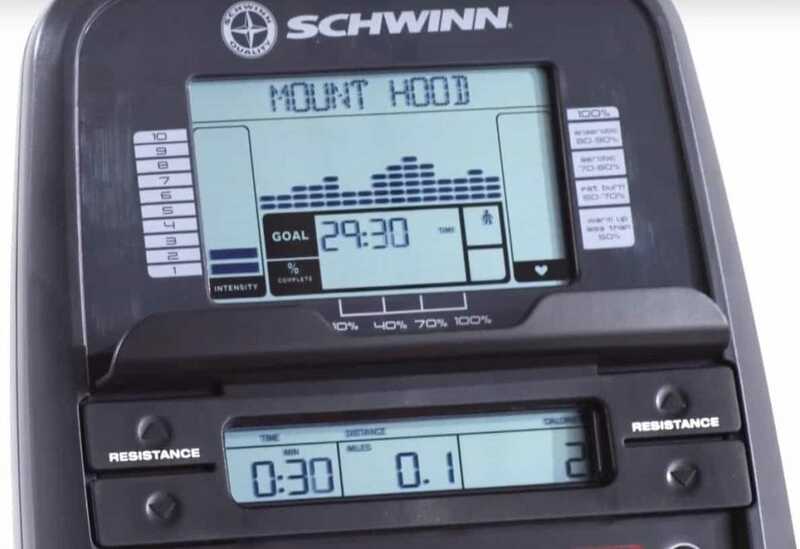 The Schwinn recumbent bike monitors your heart rate with the help of its heart rate sensors that are located on both sides of the seat. The ability to monitor your heart rate is essential. It will help you know whether you're working hard enough or not, but more importantly it will let you know if you're working too hard. My only problem with it is, the monitor is not that accurate. You can however, use any fitness tracker that has a pulse monitor to get a more accurate reading of your pulse. The Schwinn 230 allows you to have 2 user profiles to which the bike will save the workout stats. You will have to enter your name, age, weight, height and gender, and this info will be saved to your profile. Even though it only tracks the stats of your current workout, this is a handy features that will enable you to do a quick review of your workout. Furthermore, the 230 has two little transport wheel in the front. In case you don't have a permanent spot for it in your house, you'll be able to easily move it from your storage to the living-room. The Schwinn 230 has an adjustable 3 speed fan. Don't expect to get a wind that will blow your hair. However, the fan can come in handy when on the highest speed, but just to cool you off a bit. In addition there's an MP3 Input that will allow you to connect your phone or player so that you could listen to your favorite tunes. And you will able to listen to them with the set of two speakers that are located on both sides of the fan. Again, don't except a blasting sound system, but I must say that they do produce a decent sound. If you're considering the Schwinn 230 you might want to take a look at the competition. It's older brother is packed with a tad more features. In addition to all of the Schwinn 230 features, the 270 offers Bluetooth connectivity that will allow you to wirelessly sync all your workout stats to the Schwinn trainer app and from there to MyFitnessPal app. It also has a padded seat, more workout programs (29), and more resistance levels (25). Read our Schwinn 270 recumbent bike review, or check it's price here. The Nautilus R614 offers pretty much the same package that the Schwinn 230 offers. However, in the time of this review, its price tag is a bit more attractive than the 230. The Nautilus R616 is significantly more expensive than the 230. That's because it offers way more features. Like Bluetooth, syncing stats to various fitness apps, back-lited dual track display, 29 workout programs, 25 levels of magnetic based resistance, and more. The Schwinn 230 recumbent bike is more than a decent piece of equipment. That is why it is one of the most popular recumbent bikes on the market. And even though it doesn't have all the features that the 270 offers, it should be taken quite seriously. The major differences are the 230 lack of Bluetooth connectivity, less workout programs (22 Vs. 29), less resistance levels (20 Vs. 25), padded seat, and the ability to track and sync your workout stats to an app. However, the fact that it can provide a good workout, it's solid, sturdy and quiet, has a decent number of workout programs and resistance levels, might make it a good choice. So if you want a bike without all the fuzz, it might be wise of you to check out the Schwinn 230.